Thread cutting screws are a type of self-tapping screw that creates new threads in existing holes in metal. Thread cutting screws are commonly used as fasteners in items that need periodic maintenance. Thread cutting screws are most often used with wood and plastic, and do not generate as much stress on the material as thread forming screws. 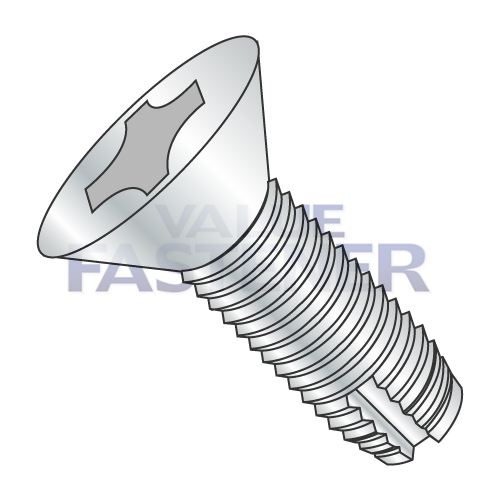 Value Fastener offers a huge selection of steel thread cutting screws and stainless steel thread cutting screws. We stock Type-1, Type-23, Type-25, and Type-F thread cutting screws in a variety of sizes, lengths, and head styles to meet your needs. Type 1 point: A Type 1 point thread cutting screw with single flute for general use. Produces a fine standard machine screw thread for field replacement. Type 23 point: A Type 23 point thread cutting screw in the fine thread series offering maximum thread cutting area and excellent chip clearing, with minimum tightening torques. Type 25 point: A Type 25 point thread cutting screw similar to type 23 point except with coarse Type B thread. For plastics and other soft materials with large chip clearing and cutting edges. Type F point: A Type F point thread cutting screw with machine screw thread with blunt tapered point, having multi-cutting edges and chip cavities.For heavy gauge sheet metal, aluminum, zinc and lead die castings,cast iron, brass and plastic. Follow the links above to find the thread cutting machine screws your application requires, or use the filters at left to narrow your search by size, length, material, finish, or other factors. If we don’t have the thread cutting screws you’re looking for, they probably don’t exist! All of our thread cutting screws are in stock and ready to ship ASAP. We offer the high quality products your project needs at low prices that fit your budget. Order today, request a quote, or contact Value Fastener for the thread cutting screws you need.